Diabetics – move on, be healthy! – Start now learning! Diabetics – move on, be healthy! Create a circle while standing. Start a simple rhythm that alternates with a pat on the legs, then a clap: Pat, Clap, Pat, Clap, etc. They do the action high and low respectively. My name is Linda Yeah! And I am ten Yeah! I like to swim Yeah! The clapping rhythm starts again and the next player goes. Continue until every player has had a chance. Make sure that everyone in the group feels comfortable. The second line (about age) can be changed to anything you want the participant to learn about each other. If you are rehearsing a play, the whole chant can be done as “your character” from the play. What type of activity does your character really enjoy? Materials: Appendix 1 (Infographic), sheets, pens, flip chart, Wi-Fi, PC or smart phones, markers, stickers, paints, chalk, leather, cardboard, patches, etc. How many types of diabetes do you know? Is there a connection between the number of people with diabetes and the level of physical activity? Each group has to propose a sport or physical activity which can be practiced by different groups of people suffering from Diabetes: adults, children, working people, women, mothers with children, pregnant women, people with mental disabilities, people with physical disabilities, with an explanation of how this sport or physical activity affects the prevention, disease and recovery of people suffering from diabetes, what meals are positive medicine for Diabetes. Materials: sheets, pens, flip chart, Wi-Fi, PC or smart phones, markers etc. How Many People Have Diabetes In Your Country? Are there diabetes prevention programs in your country? An example of good practice that you know from your country. An example of good practice in the world. Everyone presents his/her choice of good practices and how it can be improved and conducted by itself. After the presentation, the Facilitator, asks the group whether they see the strengths and weaknesses of the campaign and what they are. At the end of all presentations and after the discussions, the whole group votes for the best or the best campaigns invented and proposed by the participants during the debate. The best campaign will be promoted through social media, especially in the FB group “Start Now”. What level of physical activity He/She is doing. What is the level of physical activity undertaken in general in their country? What is the risk for diabetes in their country? 3. „We are the change“! Materials: sheets, pens, flip chart, Wi-Fi, PC or smart phones, markers, stickers etc. How can sport and physical activity solve problems related to diabetes disease? Create a campaign or sport event based on physical activity among people with diabetes type 1.
Who can participate (athletes, students, disabled people, people with obesity). What are the most important messages of the Campaign? When should the campaign take place? Create a motto, a sign, a poster, etc for the Campaign. How can sport and physical activity help problems related to diabetes? Create a campaign or sporting event based on physical activity or sport among people with diabetes type 2.
Who can participate (athletes, students, disabled people, people with obesity, people with different religions). What are the most important messages in it? Create motto, sign, poster, etc. At the end, each team presents the work he has done for around 10-15 mins. Make sure the teams are composed by equal number of participants. After the end of all activities, the Facilitator asks each participant what risks they see for themselves and others in their everyday lives, what they should change for themselves. Аll participants would be invited to participate in a 2-week training program of their choice with the appropriate diet including healthier food. It is good to present to all participants a few useful applications for smartphones (Fooducate Арр, Glooko Арр, My net diary еtс.) and articles on healthy eating and the benefits of active lifestyle. 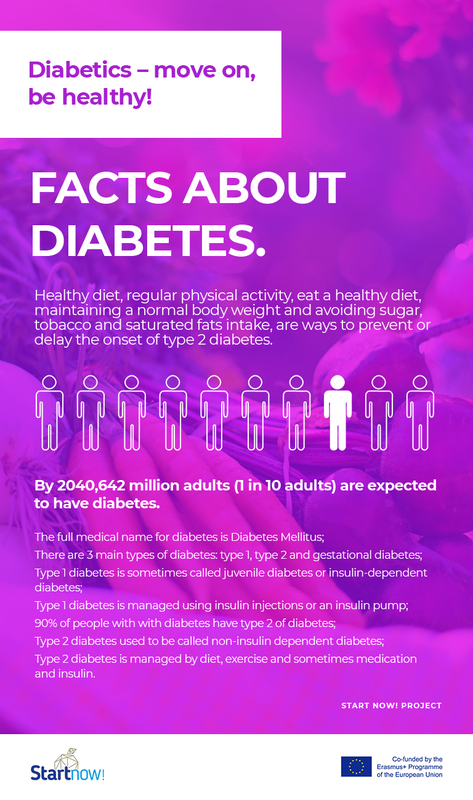 All of those tools inspiring healthy eating habits and regular physical activity are the best way to prevent Diabetes type A or to keep low levels of blood sugar if you have been already diagnosed. Materials: garden yard, lawn, park, green area, ball, ropes, colored cones, training jerseys, training ground, sports ground, school or sports hall, fruits, vegetables, water etc. The Facilitator invites participants to engage in team sports for 60 minutes, after that they have time to enjoy their award, share in the social media positive emotions of the time they have been together. The award for participants will be a fruit or vegetable of their choice with the appropriate explanation why it is important to be involved sports and eat healthy food. During the sport event, the Facilitator will also take pictures and videos that he / she may published on the social media of ‘’Start Now” page.